A fellow photographer friend messaged me and asked what I thought about reaching out to local photographers and doing a throwback of Pride photos. I asked a few questions, and about fifteen minutes later had sent out messages calling for photos. Just in time for Pride 2018 festivities, here are 7 Seattle photographers' favorite photos from last year's Pride celebrations and a little bit about themselves. Check out their favorite 2017 Pride photos, where to find them this year, and links to their portfolios. My shots are from Bacon Strip: Pride! from last year. Bacon Strip was honoring gay bars of years past in Seattle, a subject close to my heart - as we see a sea of change in our community happening in front of our eyes. Honor the lessons of the past as we move forward together! Plus - DonnaTella Howe rocks! 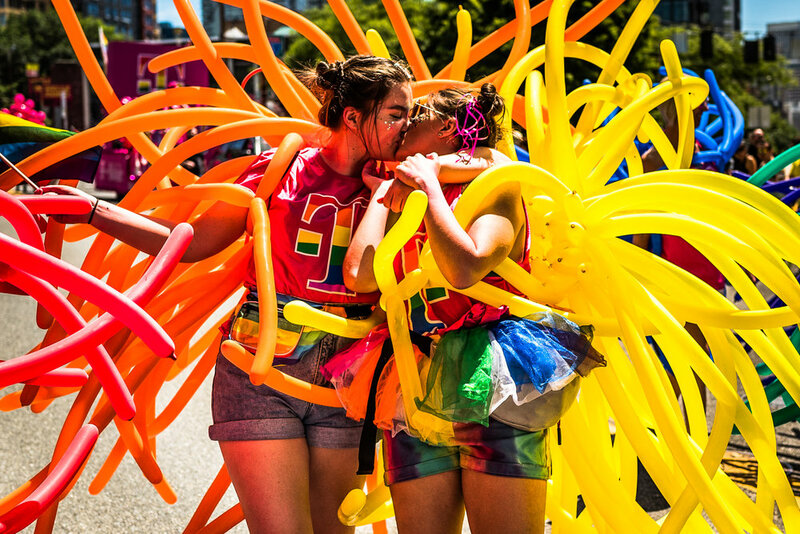 This will forever be one of my favorite pride photos we’ve taken. It’s not particularly creative, or amazing genius photography, or of some semifamous celebrity that rolled through. What really speaks to me is the message and the people in it. Especially with growing up in an extremely religious household, this photo always sticks out to me, and reminds me that we don’t have to abandon or be divided by our spiritual beliefs. Its been very comforting for me. I love the message on the banner, and the vibrant colors, and the fact that you can see the passion on the people’s faces. This shot is from Cuff’s Sunday block party last year. That’s Terri Nunn from the group, Berlin. During their wildly popular ”Take My Breath Away,” Terri had her backup dancers carry her off the stage and through the audience, grabbing hands, and singing directly to her fans. Events at Cuff constantly remind me of the generational crossovers between those who frequent the club. This year is Cuff’s 25th Anniversary, and you’ll see patrons who remember the first one to those who are coming for the first time. When I shoot at the Cuff, my goal is to represent all body types, color, ages, etc.. it’s also where I tend to use my ASL most frequently. Cuff was also the first Pride gig I ever had, which has lead to a packed schedule this year and even photographing Las Vegas pride last year. It will always be a significant moment for so many reasons. As difficult as it was to choose a single photo from my cover story in the 2017 Pride issue of Seattle Weekly, I went with the shot of Oscar Rodriguez. Oscar owns the best Mexican restaurant on Beacon Hill, Baja Bistro, and in putting a piece of himself into what he does, has turned it into an oasis for the queer community in the neighborhood I call home. This was my favorite photo from Pride 2017 because as an aspiring documentary photographer, I’m usually trying to get a photo or photos to tell that elusive narrative. I think I got close with this one, even though I did a terrible job with the exposure. I can be pretty cynical, but seeing these people, especially the child, participating in or supporting Pride gave me a nice boost of optimism.